Private Folder functionality can be configured based upon access granted from SAM which allows users to then access specific content in nextNTERACT. Change password can now be completed within the application while you are logged in, removing the need to verify the change in an email. iOS 9 compatible version of nextINTERACT is now available on the App store. Please note iOS 7 is no longer supported. User defined asset order is now maintained in [All folders]. Ability to to take notes in nextINTERACT's Settings has always existed. This feature has now been improved to have these notes to be emailed. Audio reference library – a new asset type making it easy to share audio files. PDFs background now show a white background rather than black. Automatically clear cache between viewing HTML assets versions. SmartDecks now support mandatory pages. Ability to email attachments from HTML asset. We have updated the nextINTERACT app and it’s now compatible with iOS8. Deploying the trade show display lock keeps the asset in view mode ensuring it can only be exited with a user defined password. 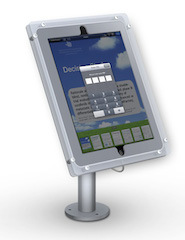 This is perfect for a trade display stand, where you want to limit a third party viewer’s access to specific information. Fixed minor interface refreshing issue in Home Screen when running under iOS7. Fixed a navigation issue in assets created in a specific manner. Quick Draw Mode: You can now enable Drawing Mode by a 2 finger double tap in ANY brochure type and engage your audience further. Search Bar: We now have a search bar added to the main library and resources, to allow for easier navigation to obtain a particular brochure. Larger thumbnail scrubber, per asset notes, and a ton of new/enhanced interact custom tags to make creating SmartPDF’s even better. Support background tasks, allowing offline data collected to be submitted to a server when internet connectivity is established again. Great for trade stands or poor internet reception zones. Minor enhancements to PDF asset type.